Card: design: 6"x8"; sheet: 9"x11"
Page: design: 8.5"x11"; sheet: 11.5"x14"
With our small craft stencil templates you can make lovely handmade cards, scrapbook pages and art journals. Beautiful Flying Birds stencil design is perfect for various craft projects, trays, flower pots, birdhouses, picture frames, furniture, napkins and anything that can use some pattern and color! These stencils are useful for creating patterned background for your artwork. Try stenciling on metallic cardstock and coloring with alcohol inks to get a slightly metallic but colorful look on your next project. These stencil templates can be used with regular acrylic paints, ink, texture paint and gel mediums. (Sold in craft stores and online). We offer 2 versions of this stencil design - small and medium. These stencil designs are perfect for card making! It's very easy and fun to make your own holiday cards, and one reusable stencil will likely last you a lifetime. You can also stencil some table runners, gift wrapping paper, boxes, and anything that can use some decoration. No need to use a spray adhesive when making cards, just secure the stencil with pieces of low-tack tape so it doesn't move around while you stencil. Textile medium is optional - it only makes the acrylic paint more flexible when it dries, which is important for wearables like t-shirts, but not so much for pillows and curtains. Complete the stenciling and let it dry fully, 24 hours is best, then heat-set it by ironing the fabric for approximately 20 sec. on a LOW setting through the piece of cloth. Heat-setting will cure the paint and will prevent it from being washed off in the washing machine. Always experiment with a sample of your fabric first to ensure good results. I've stenciled on silk, cotton, linen and even sheer fabrics with great results. It's always better if your fabric doesn't have too much texture. 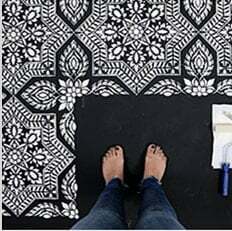 You'll need some stencil brushes and/or a dense foam roller for your stenciling project. All of our stencils are made of sturdy but flexible 12 mil clear plastic, reusable and easy to clean. In our 20+ years of professional stenciling this material has proven to be far superior than any other material we used, including the industry standard 8 mil mylar. Our reusable stencils are made to last and with proper care and storage will serve you for a long time.